9 5/8 by 12 3/4 in. Théodore Rousseau is the master. 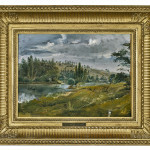 … The king of landscape painting. —Jules-Antoine Castagnary, “Salon de 1859"
Théodore Rousseau’s influence on the development of modern landscape painting and leading role in the École de Barbizon movement is universally recognized. His work in the Forest of Fontainebleau, one of Rousseau’s most revered achievements, originated from a six-month sketching career-defining trip he took in 1830 in the Auvergne region in central France, after failing to win the Prix de Rome and its accompanying scholarship, which would have enabled him to live in Italy. Rousseau was so enthused by the turbulent spectacle of nature and the austere beauty of the scenery set among volcanic mountains of Auvergne that he devoted himself to depicting native French sites for the rest of his career. In Auvergne, not only did Rousseau develop new motifs, he also found the inspiration that made him one of France’s most important and innovative landscape painters. Rousseau’s romantic feeling of the sublime is particularly epitomized in the execution, composition and coloring of the painting at hand, La vallée tournante de Thiézac. 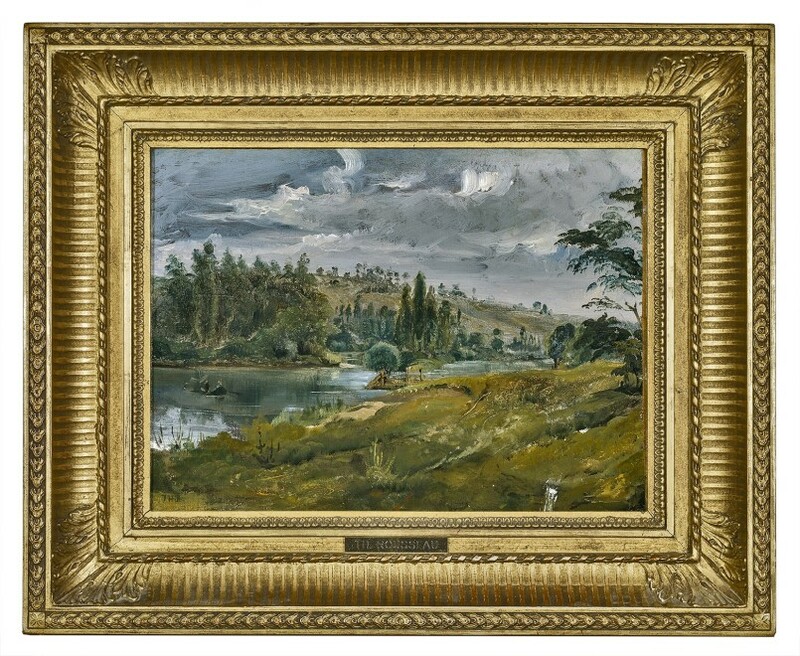 This evocative landscape echoes the power of observation seen in John Constable in England a generation earlier and the plein-air tradition initiated by Pierre-Henri de Valenciennes and Camille Corot. Rousseau’s luscious effect and attention to atmospheric effects attain their luminosity from layers of translucent green and brown glazes with sinuous strokes. Simultaneously exploring an enclosed and panoramic landscape, Rousseau draws the observer’s eye to the meandering river, whose inherent power dug the valley of Thiézac. 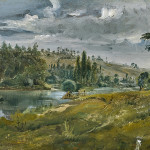 The river is the central protagonist of the painting, dividing the composition in half, while reflections of the rich and contrasting light blend the surrounding forms of nature—the stormy sky, the distant trees and the water—into a mystical whole. 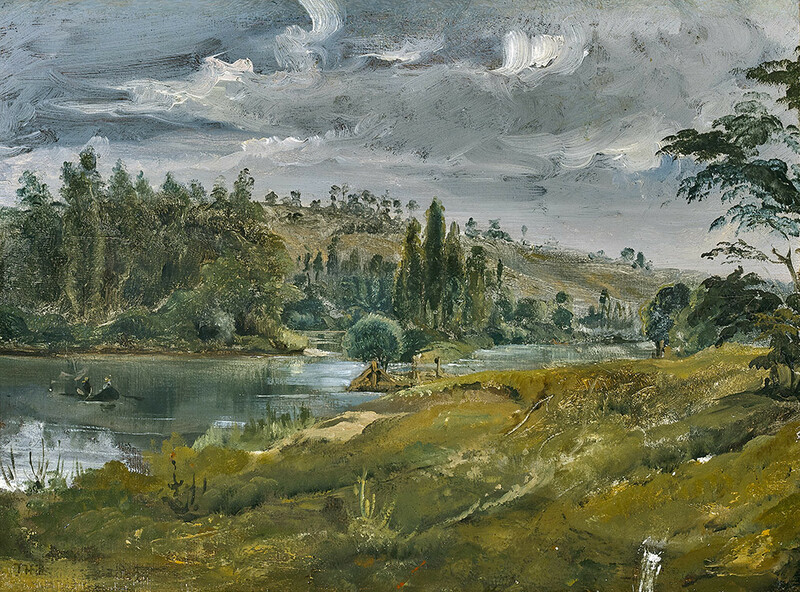 The remarkable works Rousseau produced in Auvergne attracted the attention of celebrated painter Ary Scheffer (1795–1858), who exhibited them in his Paris studio, helping to launch Rousseau’s career. By 1831, Rousseau began exhibiting at the Salon, and within three years, he acquired both a prestigious patron, the duc d’Orléans, and a medal from the Salon.